"'And this,' she would say, 'Is your uncle Juan. I loved him very much. He once farted and that became his death sentence: a great disgrace. It was during a picnic lunch. All my cousins and I were out together on the most fragrant spring afternoon, with our muslin dresses and our hats full of flowers and ribbons, and the boys were wearing their Sunday best. Juan took off his white jacket - why, I can see him now! He rolled up his sleeves and swung gracefully from the branch of a tree, hoping that with his trapeze artist's skill he could win the admiration of Constanza Andrade, the Harvest Queen, with whom, from the moment he laid eyes on her, he had been desperately in love. Juan did two impeccable push-ups and one complete somersault, but on his next flip over he let go a loud burst of wind. Don't laugh, Clara! It was terrible. There was an embarrassed silence and the Harvest Queen began to laugh uncontrollably. Juan put on his jacket and grew very pale. He walked slowly away from the group and we never saw him again. They even looked for him in the Foreign Legion. They asked for him in all the consulates, but he was never heard of again. I think he must have become a missionary and gone to minister to the lepers on Easter Island, which is as far away as a man can go to forget and be forgotten because it's not on the normal routes of navigation and isn't even shown on Dutch maps. From that day on, he was referred to as Juan of the Fart.'" Isabel Allende is a Chilean writer born in Peru. In 1989 she moved to the United States, where she has received both numerous awards and widespread recognition. 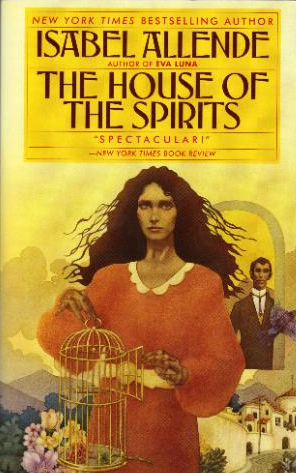 The House of the Spirits is probably her best-known novel, and it was adapted into a film starring Jeremy Irons in 1993. The version I read was translated from the original Spanish by Magda Bodin. The novel follows the trials and tribulations of the Trueba family, of which the fiery Esteban Trueba is the undisputed head. Esteban comes from poverty, but later builds a fortune from a combination of his family's estate and assorted business interests. Early on in the novel he marries Clara, a woman gifted with paranormal powers, whose contact with spirits gives both their house and the novel itself its name. It's a brilliant book full of wonderful ideas. In tone it reminded me of Gabriel Garcia Marquez's (much earlier) 100 Years of Solitude, but it's still very much its own entity. Allende uses her characters' eccentricities to paint a rich portrait of Chile's political upheavals, and after reaching the book's conclusion I was only sorry that it wasn't longer. The book's final chapters are a harrowing account of torture and heartbreak, but Allende somehow manages to end the whole thing on a high note. It's a masterful work of fiction, and I highly recommend it.